Have you got an eye for aesthetic and an understanding of dress sense? These, plus a passion for fashion, are all it takes to get started on your own clothing line. That’s right; you don’t need heaps of capital. It’s possible to launch a clothing line for less than £5,000 – or less than £1,000 if you’re painstakingly lean – as basic equipment, materials and wholesale clothing can be bought cheaply. Moreover, you won’t have to quit your day job – at first, a clothing line can be run flexibly as a ‘side hustle’. And you won’t need dedicated premises until you’ve lots of stock, so you can easily start from home. Of course, starting a clothing line has its risks. Fashion is fiercely competitive and packed with brands fighting for attention. Sales will be patchy and unpredictable at the start – after all, your average Brit doesn’t buy new clothes every day. In short, don’t expect this to be your road to fame and fortune. But if you’re in it because you love clothes and want to be part of an exciting, fast-moving industry, you’ve every chance at success. On-demand/direct-to-garment printing. This involves buying standard blank clothes, such as t-shirts, and having your own designs or logo digitally printed onto them. This is a low-cost option that’s quick to set up. Wholesale customisation. This involves buying simple garments in bulk and having them customised with your own labels, tags and designs, generally using higher-quality printing and production methods than digital printing – such as screen printing. This is higher cost, but the potential for higher margins is there. Designing and creating from scratch. This involves designing clothes, sourcing materials for them, and producing them either by yourself or via a manufacturer. This model will cost you considerably more than the previous options in money and time, but you may be able to sell at higher margins, and you will have a line that’s 100% your own. Once you’ve decided how you’ll be operating your line, you’ll need to develop your niche – that is, settle on the type and style of clothes you want to sell. Perhaps you’re into formal wear, or sportswear is your thing. Maybe you’ve always dreamt of bringing out a collection of vintage-inspired nightwear, or perhaps you’d like to explore everyday casual. Possibly you want to sell clothes inspired by another passion of yours, like travel or music. Maybe you’re in love with 70s apparel. The choice is yours. Remember, you’re more likely to succeed by specialising in something you’re familiar with and understand – that way, you can better trust your own judgement and more passionately market the line (in this industry, passion is crucial). So, plump for a niche that you love. Once you have a concept in mind, you’ll need to conduct market research before taking it any further. This will help you to understand the market and demand in your local area, ensure you have something that stands out from what your competitors are offering, and see what potential customers think about your idea – all in the hope of ensuring that it’s viable. Learn how to conduct market research for your clothing line here. In fashion, the clothes you’re selling are only half the story. The other half is told by your brand. And when it comes to convincing a customer to buy something, the latter will play a surprisingly significant role. Don’t believe this? Ask yourself, how many times – consciously or unconsciously – have you found yourself more inclined to buy something because you love the brand it belongs to? So, for the best chance at success in this industry you’ll need to devise a consistent branding strategy which informs a strong brand image that customers can engage with and grow attached to. Moreover, any successful brand will have a clear idea of its target market (that is, the customers it’s trying to sell to) and will ensure its branding remains tailored to their tastes and interests. Find out how to define and measure your line’s target market in our guide to writing a clothing brand business plan. An identity. What’s the concept that ties your clothes together? Is it their style? Their purpose? Their materials? The way they’re produced? A story. How has your personal history led you here? Why did you want to sell these particular clothes? An ethos. What will the brand’s purpose and values be? What are you hoping to bring to consumers? A personality. As the mantra goes, you are your brand. Your own personality should shine through, giving your brand a unique and genuine flavour. Everything you put out there should be in-keeping with and reflective of the above – from your name and logo to the marketing messages, website copy and social media posts you share. Of course, one of the trickiest (and yet most fun!) stages of building a brand is choosing a name for it. Getting this right is crucial; after all, your business’ name is often the first thing a customer will hear about your brand, so it’s important that it gives the right impression of the clothes you’re selling. Listing of all the words that come to mind when you think about your brand (no matter how obscure) and combining them in different ways. Taking inspiration from your favourite brands’ names. What’s the story behind them? What makes them so good? Looking up unusual words that relate to your brand’s identity and ethos. Playing around with inventing new words that sound fitting. Thinking about yourself. Can your own name be included in the business’ name? Bird adds: “I think a strong logo is important as people will see this more than the full business name, so invest the right amount of time on that. Once you’ve settled on something, you’ll need to check that it’s available and hasn’t been snapped up by someone else. Use the government’s Companies House Register to check it’s free, then get it officially registered as soon as possible. For any start-up, a business plan is a hugely important and useful document. Read up on what needs to go into your plan in our guide to writing a business plan for a clothing line. In UK business, clothing is not a strictly regulated space and you won’t require a specific license to sell it (unless you’re trading at a market, in which case you’ll need a market stall license). You will, however, need to ensure your clothes comply with the Sale of Goods Act, the Supply of Goods and Services Act and the Sale and Supply of Goods Act – which basically dictate that any products you sell must come exactly as you’ve described them. It’s the seller – not the manufacturer or supplier – who’s responsible for ensuring these contracts are met, so always make sure your items are actually of the quality and design you’re advertising before putting them up for sale. Even if your clothes line is your side hustle, you should still treat the business side of your operations seriously. You’ll need to keep on top of your books and open a business banking account; and the up-front expense of hiring an accountant will almost certainly pay off in the long run. In particular, make sure all you’re on top of your tax obligations – you’ll need to register as a sole trader with HMRC (unless you decide to start a limited company or partnership). Be sure to keep hold of all expenses receipts to avoid a nasty surprise come self-assessment deadline day. Being protected by the right insurance covers is important for any business which provides a service or product to the public – so a clothing line is no exception. In general, you’ll need professional indemnity insurance, public liability insurance and products liability insurance to ensure you’re covered if a customer or client makes a legal complaint against you, your business or your clothes. You should also seek out business insurance packages that cater specifically to clothing brands – the covers they offer will differ depending on whether you’re selling in a physical premises or online. 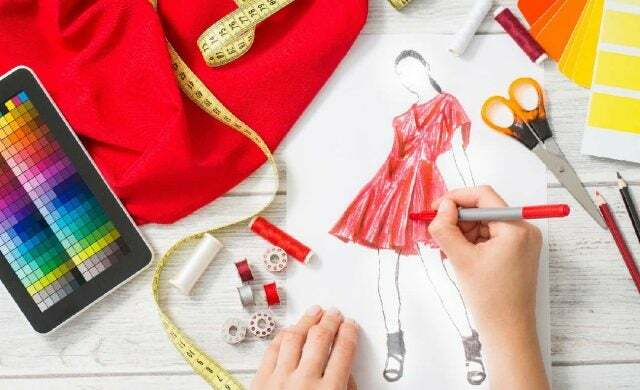 While you don’t need any specific qualifications to start designing, making and selling clothes, you might want to consider undertaking a training course – whether it’s in design, manufacture or sales. Look to your local colleges and universities, or check out The Fashion Retail Academy or the London College of Fashion to see whether they have anything that would boost your skills and experience. It goes without saying that a clothing line is nothing without clothes to sell. The real heart of your business, designing and making clothes requires a lot of research into suppliers and manufacturers. Of course, the way you go about this will depend on your model. Where you buy your wholesale products will depend on whether you want to customise them yourself with your own equipment, or whether you’d like to use a service that will customise your order for you, using your designs. While many suppliers will simply sell blank clothing in bulk, others will offer printing, embroidering and labelling services as well. Try consulting online directories, asking manufacturing and fashion forums, or asking your fashion industry peers for recommendations. Functionality – What is the purpose of the clothing? Does it need to be durable? Rigid or soft? Thick or lightweight? Quality – The textiles you use are intrinsic to your clothings’ quality. If you want to create premium quality clothes, you’ll need to source high-quality, potentially more expensive material. Lead time. The time it takes a supplier to get your fabric to you will have an impact on your production schedule. Maximum and minimum quantities. Some suppliers will ask you to buy a certain amount as a minimum – in your early stages you’ll need to find a low-minimum supplier so you don’t spend excess money and end up with too much inventory. Prices. Often, fabric will cost less per yard the more you buy. The potential for repeat orders. You’ll need the supplier to have a good, ongoing stock of the fabrics you’ll need. Fabric width. As you’ll be ordering in terms of length, make sure you’re clear on the width of the fabrics too, as this can vary. Whether you grow to receive more demand than you can keep up with or you want to outsource production from the start, at some point you’ll need to enlist a factory to produce your clothes in bulk (there’s only so much you can do at your sewing machine!). The latter is invariably more expensive, but could be a time-saver for you. When it comes to finding the right factory, research is paramount. Start by asking for recommendations from fashion industry peers. As Bird says: “There’s nothing better than a trusted introduction.” You can also search for manufacturers online – check out Let’s Make it Here’s database of UK manufacturers as a starting point. Try to look as locally as possible: you’ll need to be able to visit your factory every now and then to keep an eye on things. While overseas factories will be cheaper for you, navigating overseas shipping logistics can prove nightmarish. Plus, ‘made in Britain’ is quite a desirable statement (and can even be a USP). Next, narrow potential factories down in favour of those who are experienced in creating your style of garment and using your material. Get in touch with them to start building a relationship, find out what their minimum order is and get an idea of their prices. These days, having a website is crucial. Customers who hear about you will search for you online – and they’ll question your legitimacy if they can’t find you. Besides this, a website is a wonderful opportunity to explain what your brand’s all about and display your clothing – and, if you’re ready to fulfill online orders, it’ll make for an accessible sales channel. You can also use tools like Google Analytics to gauge public interest by recording how many people are visiting your website and the pages they’re spending most time on. You may decide to hire a freelance web designer whom you can work with closely to create your site – however, this may be expensive and will likely incur ongoing costs (many will charge for any changes down the line). Alternatively, there are plenty of low-cost website building platforms out there – such as Wix, GoDaddy or Weebly – which can teach you how to create and maintain your own site. Just remember to tailor the look, usability and copy on your website so that it’s appealing to your target audience. Learn more about building a website in our detailed guide. As a new clothing brand, social media may well be instrumental to your success, helping you to cultivate your brand voice and show off what you’ve got to offer – all for free! It’s wise to test out all social media platforms to see which get the best engagement, but you will likely find that Instagram and Pinterest work best for your clothing line as they’re image-based. For efficiency, you could consider using a social media management tool. Be sure to regularly share high-quality, professional images of your clothing (amateurish shots won’t reflect well on your brand), and do some digging into the hashtags that are big in your genre, and with your target audience (#outfitoftheday or #ootd are good starting points!). This will make your posts easier to find. Remember, clothing is an integral part of people’s lifestyles; so you’ll want to reflect your target customer’s lifestyle – or the lifestyle they’d like to have – in your imagery. If your clothes are for active outdoorsy types, for example, share images of them being worn out in beautiful natural surroundings. Social media is also a great opportunity to create early brand advocates, so be engaged and respond to potential customers who get in touch with you. You might also want to play around with competitions and giveaways to boost interest in your brand. Bloggers, vloggers and social media influencers are hugely influential in fashion. An accessible and genuine source of reviews and recommendations, fans trust what they say. So, having a big name show off your brand to their vast audience could be a turning point for you. While the magic of bloggers is that they appear to be average consumers, the most prominent will receive hundreds, perhaps thousands of samples on a regular basis. It goes without saying that sparking their interest with yours is key. Do some research into local bloggers and influencers and select only those who would be known to members of your target audience, and who wear the type of clothes you’re selling. Get to know them by introducing yourself and asking if you can send something (try not to come across as salesy). Make sure it’s something you know they’ll love – you might decide to personalise it for that extra touch. Displaying your range at fashion fairs and trade shows is an excellent way to get it in front of the buyers, influencers and press that attend these events. Moda, for example, is one of the UK’s biggest fashion trade shows. Taking place twice a year in Birmingham, the event features seminars, workshops, catwalks, exhibitions and a networking party. You can search for fashion events taking place around the world using Fashion United’s events calendar. Whether you’re taking payment for your clothes through your website, in a shop or over the phone, the first thing to do if you’re selling your clothes directly is set up a merchant account. This authorises your business to accept credit or debit payments from customers. When a payment is made, it’s processed by your merchant account – which essentially holds the money while checking the payment can be authorised; for example by checking that the customer’s account actually holds the funds needed. The money is then transferred into your business bank account. As explained in section six, having a professional website ready is key, and enabling people to buy your clothes through your website is an excellent way to start collecting sales. Having shipping capabilities is important here as you’ll need to be able to professionally package and post your clothes. While it may be tempting to charge your customer the whole shipping cost, you’ll find that many will be put off by this. Instead, consider offering free shipping (and upping your clothes prices slightly to cover it), free shipping for purchases over a certain value, or a flat shipping rate. To accept customer payments through your website, you will also need to integrate your site with ecommerce software. Magento, OpenCart or WordPress with WooCommerce are well-known examples. Ecommerce software and a payment portal will enable you to add a shopping cart functionality and give customers a page where they can securely input card details. Getting your products up for sale on online fashion marketplaces – like Etsy, or fashion giant ASOS’ hub for independent brands, ASOS Marketplace – will boost your exposure across the UK. Plus, you’ll often get business support as part of the deal. Setting up a boutique on ASOS Marketplace, for example, will cost you a monthly fee plus commission on sales – but you will receive advice on things like pricing, promotions and ways to generate more revenue from a member of the ASOS team. Markets are an excellent place to test out your range and see how much interest it gets without commiting to something permanent. Costs to rent a pitch vary by market, but many sell casual spaces for as little as £10 per day. Try to choose fashion-focused markets, or look into those which are popular among your target audience. You might also decide to take your stall to local and national festivals and fairs you know your target customers frequent. Visit our comprehensive guide to starting a market stall to learn more about making a success of market trading. To take payment in a shop, you’ll need an electronic point of sale (EPOS) system, which will encompass not only a cash register, but also a barcode scanner, a monitor, a receipt printer and, in some cases, a credit/debit card reader. A key tool for small businesses, EPOS software can also help you to track stock, track sales, view your latest prices and provide a speedy customer service. You can buy EPOS software and the hardware it’s designed for (i.e. registers and scanners) separately, but often it’s more convenient and cost-effective to look into packages that include both. You can compare retail point of sale systems here. If your EPOS system doesn’t come with a card reader, you’ll need to buy one separately. Take a look at PDQ machines and their prices here. Having your clothes on sale in department shops and fashion boutiques will give your brand unprecedented exposure and will usually mean good things for revenue – while stores will pay wholesale (read, significantly reduced) prices for your clothes, it’s likely they’ll order a lot of units. You will need a good track record of sales, plus a strong infrastructure with the capability to accept big orders and manufacture a large volume of clothes – so it’s not something to consider as soon as you’ve started. When you are ready, it’s as simple as looking for shops that reflect your clothings’ style and retail pricing and arranging meetings with their purchasing agents (if you’re working with a PR or marketing agency, they may be able to help with this). Get a catalogue of your clothing professionally printed and have it at the ready to show them. Opening your own clothing shop is another route to go down – but you’ll have to spend significant capital to get it going, and you’ll have a lot more to lose if it doesn’t work out. So, before opening a shop, you will need to build up a strong sales history by selling in any of the above capacities; develop seamless manufacturing capabilities; and drive brand awareness through effective marketing to give yourself the best chance of success. Check out our comprehensive guide to opening your own shop to learn more about running a retail business, or our guide to launching a clothes shop for more industry-specific advice.